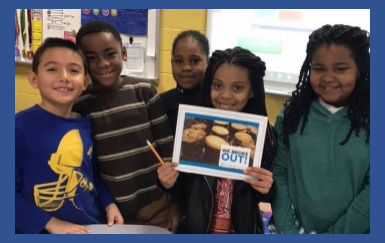 Digital breakout activities at Covington-Harper Elementary are engaging students in learning while encouraging teamwork. Sara Ross, instructional technology coach, learned about the activity while attending a technology conference. The resources are provided by a website, breakoutedu.com. To complete the activity the student team has to break the locks before time runs out. The website allows teachers to create their own games or choose from digital subject packs, which include math, science, social studies, library/media literacy, and world languages. The site also provides the chance for teachers to review student responses after the activity. Ross has also purchased two kits that come with six physical boxes and locks. The site provides puzzles that can only be used with the physical boxes and locks, as well as some puzzles that are hybrid, meaning the online games and the physical box/locks are used in the activity.